Hope you’re having a Pil-easant week. This is a blog article dedicated to all Pilates enthusiasts who have just passed their certifications and is now ready to teach Pilates as a Certified instructor. Firstly, Congratulations on your achievement and embarking on such a beautiful journey that will not only improve your own health but also the health of your students. The Swiss Pilates Institute (SPI) offers Pilates International Certification Courses. Each Course has it’s supervised training hours, assignments and peer studies. After a few days of intensive training; there is still some work to do! You are required to observe, self-practice and practice on others for a certain number of hours and then pass exams before becoming certified Pilates instructors. Therefore, Pilates curriculums are intense! When you enter your next Pilates group class or enter your 1st Pilates Class as an instructor; you are surely going to see things very differently from this point onwards. Consider this your growth point as this is the stage where you become consciously aware of every movement, every breath and every transition from one exercise to the next. With so much knowledge, studying and practicing, you have been doing so far, teaching your 1st Pilates class might be overwhelming as you know so much but don’t know where to start. Prepare a script (if required) for each exercise to ensure that you cover the basic principles of Pilates and apply them to each exercise. Keep it simple in the way you explain as there is a lot to focus on during every exercise – your breathing, your spine position, your posture, your movement…etc. The students in your class may be have different experience levels in Pilates which is why you must be aware of how you explain your exercises to your students. For those who don’t get it, take a judgement call. Notice their body language showing cluelessness or observe them not doing the exercise correctly. Make sure you give special attention to those students to show the Precision, Skill, Care in your teaching – the motto of our Institute. Further to the above point, after completing a couple of exercises during the class, you will understand your students a bit more and there may be instances where you should show how to perform the exercise first before telling them to do so. You might correct someone’s posture at some point and this may require you to touch them. Be careful at this point as some people don’t like to be touched especially if your client is not of the same gender as you. You will know from the body language immediately. For such cases, it’s good to ask permission before touching them. Show your confidence through your teaching by explaining clearly and transitioning from one exercise to the next as smoothly as possible. Think about your Pilates Master / Mentor; what they would do? How they would run the class? Teach Pilates from the HEART; it’s not the money, it’s not the fame, it’s not for competition; just a genuine love to help individuals improve themselves through a brilliant and tested method. Take learning points from your first class and correct yourself in the next – it’s a learning journey at the end of the day so enjoy every bit of experience you achieve. It gets more comfortable and easier from this point onwards. Start building relationships with your students as this is what makes them comfortable to stick with you and will help you to become more confident over a period of time. Apply different styles of learning to the class based on your observations, experience and learnings so far. You will know what worked and what didn’t and you can apply this accordingly for your next class. Make it easily comprehensive and FUN! At the end of the class, ask for feedback and suggestions for improvements from your students and work towards building that. 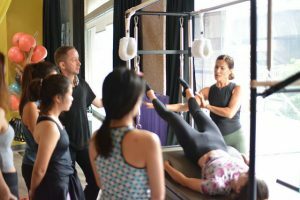 By educating individuals and increasing awareness about the Pilates method, you are contributing to a health community since you are giving them an opportunity to improve their body conditions and movement capabilities. By teaching Pilates, you may knowingly or unknowingly help someone emotionally by making them feel good about themselves. If not emotionally; surely physically, whether the purpose is for rehabilitation or for looking really attractive (provided that Pilates is practiced regularly with the correct breathing techniques). As a 2nd Generation Pilates Professional, I got the privilege to be trained and mentored by Pilates Elders – Alan Herdman, Romana Kryzanowska and Ron Fletcher, and I was and still am very passionate about passing on that authentic knowledge to others. I therefore, followed my passion and introduced the Swiss Pilates Institute (SPI) which implements the Pilates curriculums that I have developed by gathering all the knowledge, learnings and experience I received from my Pilates Masters. Each Pilates certification is taught from the heart with the onward expectation of new instructors doing the same thing. I wish you all the very best for your 1st Class and for many classes to follow!